POP A TOP IN SHERIDAN, WY!! THE SHERIDAN BREWING COMPANY! Good as Cookie’s coffee is, after a long day of fillin’ up on dust on the trail ya wanna sit back with a cold brew or soda pop…Oh yeah, cowboys love a grape or orange pop, look it up… And the place brewin’ up the best is the Sheridan Brewing Company! In 1887, Arnold Tschirgi, George Paul, and Peter Demple, joined forces to found The Sheridan Brewing Company. First they had to avoid robbers’ intent on stealing the business’s start-up money. Thieves were common along the Cheyenne to Deadwood stage line. So, the men sent the $10,000 in gold by the Northern Pacific Railroad to Custer Station, and transported the capital the rest of the way by wagon. By 1888, the brewery distributed its first product. A year later, in 1889, The Sheridan Brewery expanded its operations, producing millions of barrels of beer before Prohibition in the 1920s. Undeterred by this law, the brewery shifted to new products like near beer Sherex and an assortment of fruit-flavored soft drinks. By the end of Prohibition in 1933, the brewery was producing 600 barrels of bear a day. 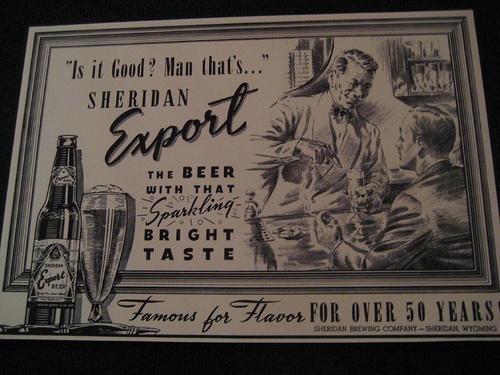 By 1954, 60,000 barrels a year left the brewery, and at this time the Sheridan Brewery stopped its beer operations and focused on soda pop. That same year the brewery became the first company in the United States to bottle its products in flat-topped cans. The Can-a-Pop Beverage Company quickly became the leading producer of canned soft drinks larger than any other plant in America. Franchises started up in Los Angeles and Compton, California and Peoria, Illinois. But as quickly as Can-a-Pop sprung to the top, its bubble was popped by such brands as Coca Cola, Pepsi, Fanta and Nehi. These brands held national recognition and advertising and edged out the hometown soda company. The brewery was torn down in 1994, and a park is now at the spot of Sheridan Brewing Company. But never fear there are still plenty of places in Sheridan, Wyoming to have a cold one…Right Cookie? Blair, Pat, Prater, Dana and the Sheridan County Museum. Images of America: Sheridan. Arcadia Publishing, 2008. How far did they deliver? Or did they? Beer doesn’t keep like liquor does, so I wondered how it was transported over long distances–or if it was. Let me look up how far away the Sheridan Brewery delivered. I don’t have that source with me at home, but I’ll get back to you tomorrow. 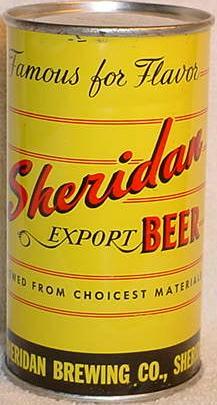 The Sheridan Brewing Co. delivered into Southern Montana and Northern Colorado after Prohibition in the 1930s. They tried to expand Nationally, but of course couldn’t compete with the big names. This was one of the reasons they gave up the beer franchise and turned their attention to soda pop, but Coca Cola and Pepsi were right on their heels and that failed, too. They used trucks for delivery. what park was put in it’s place? is there a landmark? So sorry it took me a bit to get back to you. The park is Mill Park. To my knowledge there isn’t a landmark to date, but the city is working on a walking trail around that area, so they might have something in the future. Sheridan Beer cans under the bathtub they are in great condition and look so cool. That is cool, Darci!! It’s always fun to find treasures! I have a wooden beer crate from the Sheridan Brewing Co. It holds 24 bottles. Let me know if you would like to see pictures. Thank you for the offer. I worked at the Sheridan County Museum for a few years and we had some of those crates, so no need to post pictures. Great artifact! I found a giant feature matchbook with Best wishes to you from Sheridan beer on the cover. I would like to donate it to the museum if you want it. Please contact me if this is something that can be pursued. I’m sorry, I’m no longer with the Sheridan County Museum, so I cannot help you with your inquiry. I would recommend you contact the museum directly and they can help you. Best of luck and thank you! If anyone has Sheridan beer/ brewing co. Items they are willing to sell, I am interested ???? Hi, I have a Metal “NO SMOKING sign that came from the Sheridan Brewery that I would sell. I also have an antique Sheridan Lager Beer can but I have someone interested in it. Are you interested? Gary, I don’t collect Brewery items, but you might contact the Sheridan County Museum. I have a Sheridan Picnic Beer bottle found I found in a garage in Laramie in 1979.
katrina, i may have something of interest to you…old sheridan brewing co playing cards. You might contact the Sheridan County Museum regarding those playing cards! Sounds interesting, but I’m sorry I’m not a collector. Do you still have the playing cards from the Sheridan Brewing Co? To Katrina, have a Sheridan Brewery iron keg, 7 3/4 gal.. Much better shape than the one in the mall. Priced a little high because where you going to find another one? Yesterday 7/24/17 I found an old Sheridan Brewing Co. aluminum 15.5 gallon beer keg with old Sheridan Export tap. Is there anyone out there that can help me date these items. Prior to 1954, the Peoria, Illinois “Can-a-Pop” franchise was actually a successful regional brewery called “Gipps Brewing Corporation.” It was originally founded in 1881. In 1952 the brewery was acquired by a group of Peorians who invested another $250k into expanding the operations and tweaking the formula of its flagship Amberlin Beer, which proved to be a fatal decision. 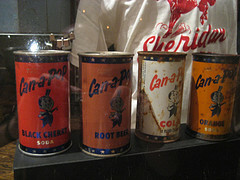 Two years later they had sold the brewing rights to a company in Chicago and started making Can-a-Pop. By 1956 they had gone bankrupt. Full timeline of the brewery is available on my website link. Hi! I am the greatgranddaughter of Peter Demple. Was interested to see that they are reserecting the Sheridan Brewing Company at the old Boot Barn. Will be interesting to see how that goes. Breweries are big business now it seems.